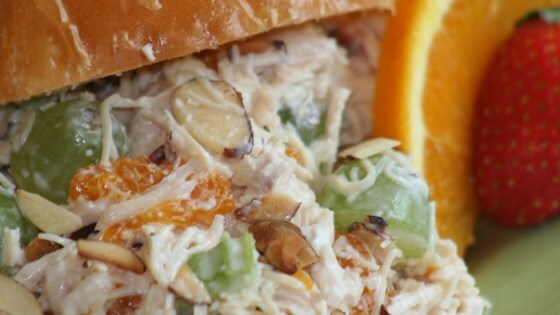 "This recipe is great for picnics and potluck luncheons. It's cool, light, and great for a hot day's lunch on the patio. Serve on crescent rolls, with crackers, or your favorite bread." Mix together chicken, grapes, nuts, celery, oranges, and dressing. Chill. This was a really great recipe, although the chicken from the can was a little salty. Next time I am going to use fresh chicken. I used red grapes instead of green, used Miracle Whip for the dressing, and chose walnuts over almonds. This recipes was awesome. The flavors go great together. Definitely a keeper! I love it! It is my favorite. I use red grapes to add more color. Something I will make again.